Released in November 2008, LGA1366 supports only Core i7 CPU from Intel. The coolers below will not only cool Intel's CPUs better than any stock cooler, but they will also do it very much more quietly. 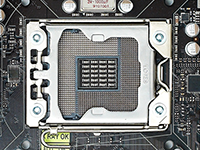 In terms of currently-available processors, LGA1366 has now been replaced by LGA2011. LGA1366 motherboards and processors were officially discontinued in 2012.